La Madrina Enriqueta Vargas Ortiz (b. 1959 – d. 2018), the charismatic leader of Santa Muerte Internacional, has died after a prolonged battle with cancer. The SMI temple in Tultitlan will hold a viewing on December 19th at noon, beneath the feet of the largest statue of Santa Muerte in the world. On December 20th she will be laid to rest alongside her son, Jonathan, in Jardin de Recurdos cemetery. Vargas made a promise to Saint (Death), “You turn over his killers to me, and I’ll try to to take you the greatest heights.” The once devout Catholic, who had up to this point been uncomfortable with her son’s fervor, pledged she would devote herself to tending Santa Muerte’s tradition if the Powerful Lady would bring justice to the murderers that took her son’s life. Events over the coming months transpired such that Vargas felt Saint Death had fulfilled Her end of the bargain, and since then La Madrina Vagas began tending to the Tutilan shrine with vigor. Through her innovative use of social media platforms and digital communication tools, along with her charismatic Evangelical-style leadership, the organization has become a popular source for information on Santa Muerte, built upon a strong global community of devotees connected through live video coverage of regular worship services at the shrine and digital outreach on Facebook. 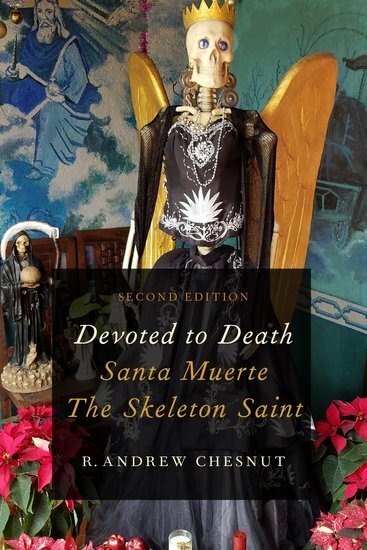 Along with her ministry for Saint Death, Vargas reported a series of visions of her son acting as an intercessor and intermediary for Santa Muerte, building the public narrative of his empowerment. Other devotees associated with the temple, and some devotees outside SMI, have reported similar experiences and miraculous events surrounding him as well. The ritual necklaces that he wore have become a symbol of faith and spiritual power of SMI. They were with him at the time of his murder in 2008, and since receiving them, Vargas continued to wear them at every service she oversaw. While Enriqueta Romero Romero was the pioneer in transforming what used to be an occult practice known to very few Mexicans into the burgeoning public devotion that it is today, Enriqueta Vargas quickly became both the public spokesperson in Mexico and a dynamic agent of evangelization and institutionalization uniting shrines and temples across Mexico, the U.S., Colombia, Costa Rica, and Guatemala under the command of SMI. More than any other devotional leader it was Vargas who played the biggest role in making Santa Muerte the fastest growing new religious movement in the West, with some 12 million devotees across the globe. Andrew: On a personal note, I will miss her beaming smile and unmatched hospitality. She opened the temple doors of SMI to me on numerous occasions allowing me to interview devotees for my book, “Devoted to Death.” Descansa en paz, Enriqueta. David: Enriqueta was a true pioneer, an astoundingly adept leader whose community ministry in Mexico City was able to expand to a global scale, all under the unlikely banner of Santa Muerte – la Dama Poderosa – who Enriqueta saw as a figure of faith, charity and inclusion, while at the same time being open about her own struggle to come to human terms with the pain and suffering she experienced surrounding the death of her son. Her dedication and openness turned SMI into a world wide truly ecumenical effort to life up the marginalized and dispossessed. She will be missed, but her spirit lives on.